Find the right balance between serving your community while also delivering business results. Put simply, FanAuction™ is the ultimate destination for buying and selling social media fans and followers. Building a word of mouth network of fans, evangelists and advocates takes time. 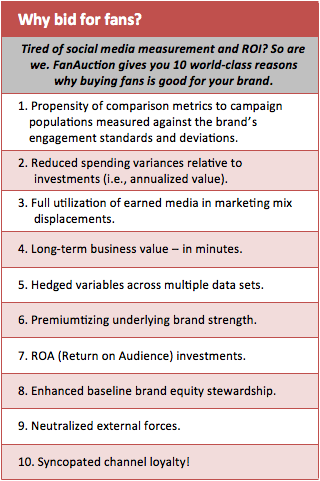 For some brands, it may take years of dedicated, resource-intensive work. But not anymore. With Ant’s Eye View’s FanAuction™, the system to help you Get Fans Now™, you won’t have to invest any more time or money to create relationships with customers! Using our patent-pending High Enterprise-Level Maturity Advocate Acquisition Platform™, you can start building long-term business value in a short amount of time: overnight. (In some cases, it’s just minutes.) Whether you need 10,000 new fans for next Tuesday’s Tweetup, or 100,000 fans tomorrow for your company’s Facebook fan page on substrate drilling in the Gulf of Mexico just in time for Congressional hearings, FanAuction™ can get you the fans you need, at a price you can afford. It’s fans for everyone. Our patent-pending High Enterprise-Level Maturity Advocate Acquisition Platform, (HELMAAP™), scours the world for the world’s most riveting, most sought-after influentials. Then, they’re sorted, ranked and batched into HELMAAP’s True Representation Of Universal Groupie Hierarchy™, or TROUGH™, and made available for you to purchase and add instantly to your Facebook fan page, Twitter account, LinkedIn account, RSS feed or other business-critical social channel. Not as much as you’d think! That’s the power of the FanAuction™ fan platform. The market truly decides. No expensive contracts. No negotiation. Just click, bid and purchase. No fuss, no muss. What other services does FanAuction™ offer? 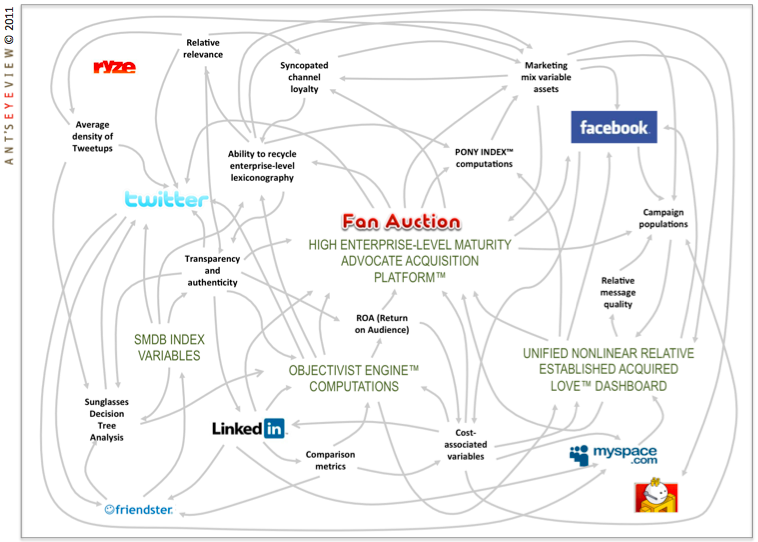 Besides acquiring thousands of fans in minutes through the HELMAAP™ engine, powered by our TROUGH™ system, FanAuction™ offers a just-in-time tool for delivering enhanced weekly or monthly metrics reports to demanding company shareholders through the Unified Nonlinear Relative Established Acquired Love (UNREAL™) dashboard. No guarantees, but FanAuction™ might even help you win a coveted social media award. Tired of your fans? Have too many? FanAuction™ gives you fan liquidity. Sometimes brands have too much success. 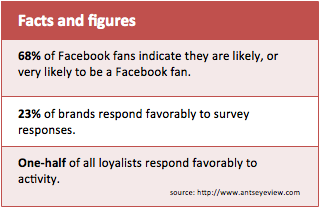 Whether it’s due to a successful Groupon campaign, or a casual mention in an Ashton Kutcher tweet, some brands may need to quickly dispose of their acquired fans because they’re simply unable to meet demand. FanAuction™ solves that problem. Just put up a block of your lowest-value fans for sale, name your price and watch the bidding war begin. With the backing of Silicon Valley’s largest supermicroangels, three of the most expansive minds in advocacy, influentials and enterprise-level business lexicon have spent close to ten years in the Ant’s Eye View Marketing Science Laboratories developing FanAuction™. With the core algorithm nearly perfected, FanAuction™ is nearly ready to emerge from stealth mode and revolutionize marketing, public relations, promotions, organizational design, promotions, etymology, communications, promotions and conceptual business thinking. In short, FanAuction™ will change everything. Which of these is a deity?